A recent post on the popular provincial politics blog The Sir Robert Bond Papers strongly implies (but does not explicitly state) that raising university tuition has no effect on levels of university participation. "Now for all those who believe that lower tuition fees allow more people to go to university guess again. There’s actually evidence that low tuition fees won’t make it easier for promising students from low income families to attend university." In support of this view, he cites a paper from the Frontier Centre for Public Policy. This paper turns out to be seriously flawed. 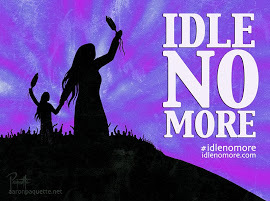 "As surely as night follows day, government announcements that university tuition fees will be permitted to rise are immediately followed by howls of condemnation from student organizations. " which is rather dismissive of student concerns. Moreover, the Frontier Centre for Public Policy clearly promotes a right-wing, small government political agenda as can be seen by this note on the optimum size of government. But let us look beyond the obvious partisan bias and try to evaluate the report on it's merits. The methods used in the report are quite simplistic and easily understood by people with little knowledge of statistics. 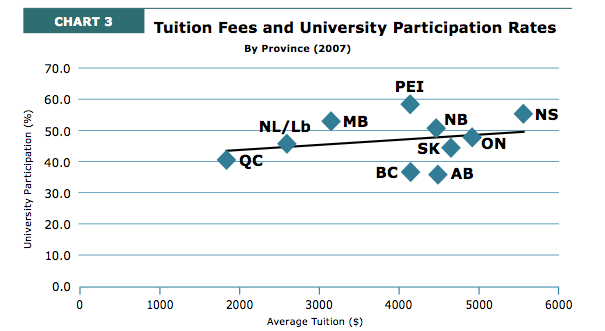 All they do is measure the correlation between cost of tuition and university participation in Canadian provinces. Here is a scatterplot from the study, along with the "line of best fit". What this chart shows is that provinces with higher tuition have slightly higher rates of university participation than those with lower tuition. 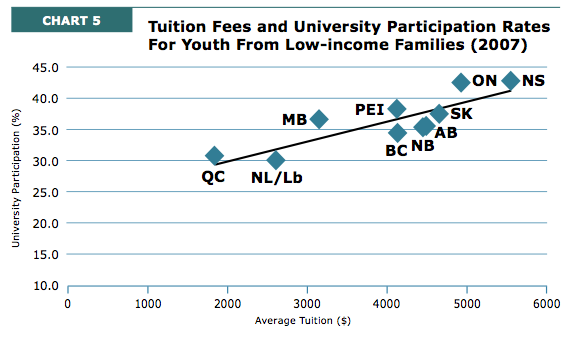 There is a similar chart showing that participation rates for low income people is higher in provinces with high tuition. That is as far as the statistical analysis goes. 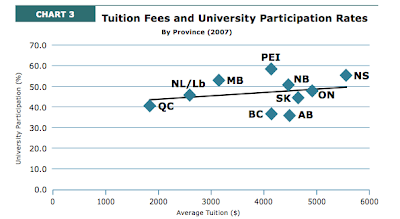 There is no consideration of how tuition and participation have varied through time, there is no effort to account for differences in the education systems between provinces (such as the fact that Quebec has two free years of CEGEP), no effort to work out the direction of causation (do provinces set tuition rates low because participation rates are low? ), no effort to account for confounding variables at all. There is basically nothing except these two charts. "What conclusions can and cannot be drawn from this data? This evidence does not demonstrate that tuition fees have no impact on university participation rates, either in general or for students from low- income families. Many factors influence university participation, and we examined only the correlation between tuition levels and university participation. To be sure, it is possible that if Manitoba, Quebec and Newfoundland had higher tuition fees, the gap between those provinces and provinces such as Ontario and Nova Scotia in terms of low-income participation, would be even larger." They offer some speculation for why tuition levels do not correlate with participation, but they don't bother citing any research to back it up, so I will. This Statistics Canada study (done by actual statisticians using statistics) found that young people who live within 40 km of a university are 50% more likely to attend university. Young people from low income families living within 40 km of a university are four times more likely to attend university than those more than 80 km away. This makes a lot of sense, because it is a lot cheaper to attend university if you can live with your parents rather than renting an apartment. 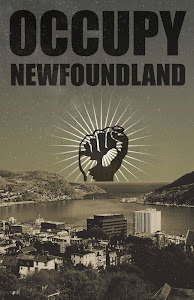 Only two fifths of Newfoundlanders live within 40 km of a university compared to two thirds of all Canadians, so geography is a much more significant obstacle for university participation in this province than elsewhere. Keeping tuition low helps compensate for our geography. Another well known fact found in the Stats Can study is that children of parents who went to university are much more likely to attend university than children of parents who did not. The boomer generation in NL have significantly lower levels of education than Canadian boomers, so all else being equal we should expect lower participation rates in NL. There are several econometric studies that try to measure the effect of tuition hikes on university participation. A summary of one study posted by Canadian economist Stephen Gordon (a prominent supporter of tuition hikes), estimates that raising tuition by $1000 per year reduces participation by about 3%. A study from the UK found that raising tuition by £1000 reduces participation by 4%. I did not cherry pick these studies; they were the first ones I found using a google search. It is fair to say that these effects are fairly small and one can reasonable argue that they aren't worth the cost to the taxpayer. Stephen Gordon (and, I believe, Ed Hollett) advocates raising tuition and using some of the revenue to provide financial support to low-income students, a policy that makes a lot of sense to me. I also believe that the provincial government has a serious structural budget deficit and that both program cuts and tax increases will be necessary to deal with it. But crappy studies from right-wing think tanks are not a useful contribution to this public policy debate. A nice blog post listing several US studies estimating the link between tuition increases and enrolment decline. The median estimate is that a $1000 tuition hike corresponds to a 5% drop in enrolment.